While hiking and staying outdoors, it’s important to stay hydrated, especially during the hot summer days. For traveling you have the option of either bringing bottled water, drinking unknown quality tap water or using a filtration system on the go. Taking bottled water for the entire duration of your camping or hiking can put a strain on your back, especially if you are backpacking. Drinking from unfamiliar sources can be just dangerous. That’s a water filtration system can be the best choice. Among water filtration systems for camping, you can either buy portable water purifiers or a water bottle with an integrated filter. Both options are quite handy as you can get clean drinking water anywhere you go without having to carry a heavy load of water. The portable water purifiers are a better option because they can purify even stream water, while not all the water bottles can. But what is the best water bottle with a filter? Below we have a list of top picks that are worth considering. CamelBack Groove Bottle uses a plant-based carbon filter is built into the straw and can filter up to 48 gallons of water. It has been NSF tested for the reduction of chlorine taste and odor. So what you get is an improved taste of the water, but the filter cannot remove bacteria and viruses. To use it just add the water to the bottle, then as you drink through the straw the water is filtered. The bottle has the capacity of 20 ounces. It’s made from BPA-free plastic and weighs 4 ounces. There are two versions of the Camelback Groove: insulated and not. 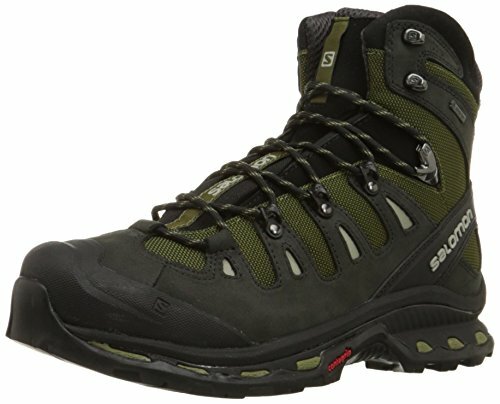 The insulated version has a double wall construction. This helps to keep the water colder for longer and reduce condensation on the outside. The insulated bottle is also a bit bigger. The Clear2Go Portable Water Filter Bottle is a good option for those who want to filter natural water or tap water. The water bottle has a built-in filter that can clean out one hundred gallons of water – the equivalent of 757 regular sized bottles of water you could get from the store. That alone means that the water bottle is worth checking out since it’s a good value and can save you tons of money in the long run by allowing you to more comfortably drink tap water from whatever source happens to be nearby. Contoured design fits easily into the hand, and also fits into standard cup holders, etc. The filter must, of course, be replaced when you near the hundred gallon mark. However, the bottle comes with the first filter, and you can pick up other filters to replace it easily and cheaply. Who is the Clear2Go Portable Water Filter Bottle For? This is a great water bottle for many different people. 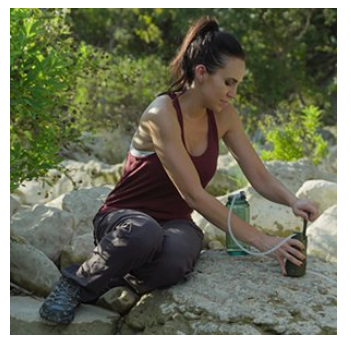 Hikers could easily use the Clear2Go Portable Water Filter to get chemical tastes and residues out of the chemically purified water. It’s also great for anyone who wants to get water on the go from water fountains with less than tasty water supplies. Use it at the gym, at home, or at the office to get water of a similar quality to bottled water for a much, much lower price. Portable water filter bottles are available at a few specialty stores, but you will obviously find the widest selection (as well as get the best price) when you buy online. Click here and get today’s best deal now! The Katadyn MyBottle Portable Water Filter Bottle comes from one of the top names in water filtration: Katadyn. The water bottle features a sleek design and a replaceable filter that filters down to .03 microns with a glass-fiber and carbon filter. The twenty-four-ounce bottle will filter up to twenty-six gallons, and the bottle weighs just eight ounces. Here’s what you need to know about the Katadyn MyBottle. 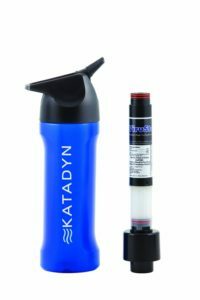 The Katadyn MyBottle features a replaceable filter that will filter up to twenty-six gallons – or a hundred liters – of water, depending on its original quality. It will remove grit and particles as well as bad tastes and smells from the water. It filters down to .03 microns, so most water will come out tasting clean and clear. It also has a twenty-four-ounce capacity, after filter displacement is accounted for. Is the Katadyn MyBottle the Right Choice for You? If you’re looking for a water bottle that will make your office water taste better and save you from buying bottled water, the Katadyn MyBottle Portable Water Filter Bottle is the best option for you. However, if you want a water bottle that will make natural water potable and disease-free, you’ll either have to go with another water bottle or purchase the separate premium filter core for the MyBottle. You can find the Katadyn MyBottle easily online, and the best part is that you’ll get the best price online, too. Click here to get today’s best prices on the Katadyn MyBottle Portable Water Filter Bottle. When backpacking or hiking, you want your gear to be as lightweight as possible and what better way to do it than having a unit with six functions in one. 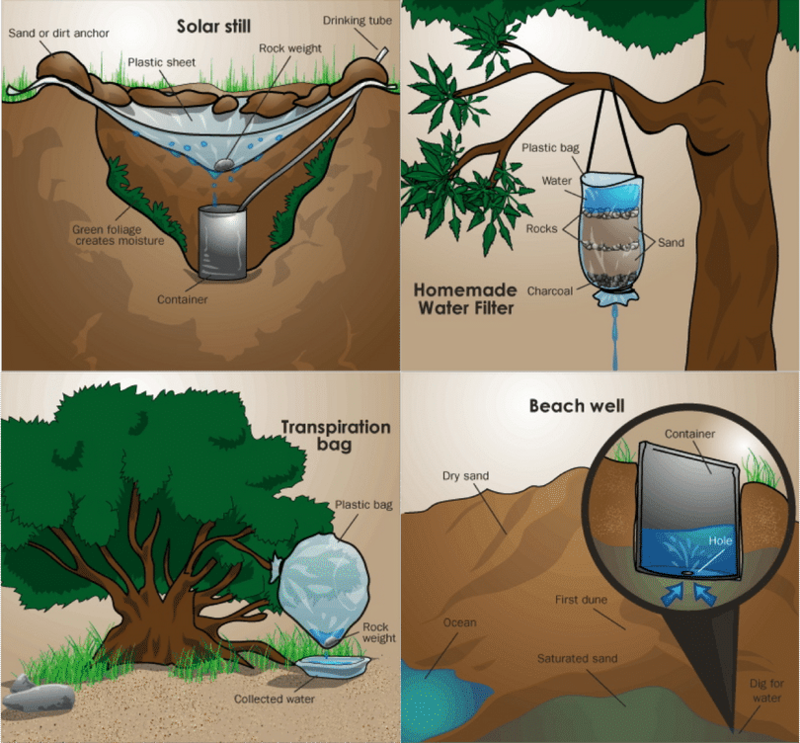 OKO H2O comes with two filters and can also be used as a flashlight, lantern and a storage compartment. The 2 filters are designed for different water quality. One of them is a carbon filter and to be used for filtering and improving the taste of tap water. The other can be used for purifying the water when you are off the beaten path. It removes bacteria, cysts, and other water contaminants. The filters are located at the top of the bottle. The bottom section can be unscrewed for use as a small cup or a mini storage place, where you can keep small items like keys. The bottle also comes with a light adapter, so you can screw it to the bottom and use the unit as a flashlight or hang it on the included handle for use as a lantern. The bottle’s capacity is 22 ounces, and the small cups is 8. LIFESAVER Systems 4000 is a perfect choice for traveling, hiking, and emergencies. It filters the water by not only reducing chlorine odor and taste but also eliminating all microbial waterborne pathogens. It is fitted with a 4000UF purification cartridge that effectively removes from water bacteria, cysts, viruses and other contaminants. The cartridge has holes 15 nanometers across, eliminating even the smallest viruses. The bottle also includes a carbon filter for reducing chemical residues, such as lead, copper, pesticides, and others. It’s easy to use. You just need to unscrew the base, find the nearest water source, dip the bottle into it and pump the water. In just a minute you can have 25 ounces of clean drinking water. The filters also have a long life. The 4000UF can filter more than 1000 gallons of water and the carbon filter about 66 gallons. LIFESAVER water bottle is a great solution to stay hydrated wherever you go. It is approved by the United States EPA. The Brita Hard Sided bottle works the same way as the CamelBack Groove. It uses a carbon filter and is suitable only for tap water, but not for stream water. It improves the taste of the water by removing from it chlorine taste and odor. It’s also made from plastic that is BPA-free, but it has a hard body for more durability. The capacity is 23.7 ounces. One of its benefits is that all the parts except the filter are dishwasher safe, allowing convenient cleaning. One filter lasts about 40 gallons of water. Aqua Vessel will keep your water both cold and clean from many impurities. Its carbon filter is tested to remove toxic chemicals, heavy metals, chlorine, microscopic pathogens, sediment, and dirt. So you can use it either around town for tap water or in the backcountry for purifying river or stream water. Additionally, the bottle features a MiraGuard antimicrobial technology designed to keep the filter free of mold. The bottle is made from premium stainless steel and has vacuum seal insulation to keep your water cold without any condensation. One of the most affordable options among best filtering water bottles is the Water Bobble. Its intended use is for municipal tap water as its carbon filter reduces only organic contaminants and chlorine. It has 24 ounces capacity and 40 gallons of the filter use. The Bobble couldn’t be easier to use – just fill and drink! Some people complain of a loud noise when the bottle is filtering. However, squeezing the bottle rather than sucking on it can make water come out with little to no noise, and a bit of noise is well worth clean, great tasting water! The Bobble Portable Water Filter Bottle should be on everyone’s list. If you find yourself buying bottled water to avoid drinking from the tap at home, work, or school, the Bobble can certainly help. It may not be the best option for the gym, since water filters somewhat slowly, but it’s great for any other time you’re drinking municipal tap water! You’ll find the widest selection of Bobble water bottles, as well as the best price when you buy online. Click here and get Today’s Best Deal now. There are many different water filter bottles available that offer different options like filtering just chlorine or all the other water contaminants. If you are looking for a water bottle that you could use anywhere on your backpacking trips, then the best water bottle with filter options would be OKO H2O Odyssey, LIFESAVER and Aqua Vessel. For just reducing chlorine taste and odor in the tap water, good options are Camelback Groove and Brita Hard Sided water bottles. The top picks chosen for our filter water bottle reviews are based on their performance, rating and reviews of users. A portable water filter bottle can come in handy when you are out and about, and the only type of water that is available to drink is questionable at best. This is especially important while traveling to other countries where the filtration of the water is not as advanced as it is here in the United States. With a portable water filter bottle, you will not have to worry about drinking the water where you are visiting and becoming ill from inadvertently consuming a bacteria, protozoan or cysts that can put you in the hospital or worse yet, kill you. It has been known to happen, and the situation could have been avoided by simply filtering the water through a portable water filter bottle. There are many types to choose from when looking at the different kinds, makes and models of water bottles with built-in filters. Choosing the best one for your needs and lifestyle are not difficult. The major difference between each one is the design of the outside of the bottle because a portable water filter bottle works the same as the next one. People purchase portable water filter bottles for many different reasons. One reason is in case they are ever broken down in their vehicle and help is not readily available. Others are purchasing them in case of a natural disaster that causes contamination of the current water system, or a cease in water delivery to the home. Even others are purchasing them just because they like the peace of mind a portable water filter gives them in knowing that their water quality is protected. Water from any source including streams, creeks, rivers, lakes or even a ditch can be filtered through a portable water filter bottle and become safe from microbes to drink. 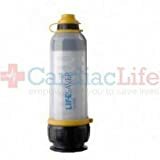 The portable water filter bottle does contain a disposable water filter inside that will need to be replaced on a regular basis to ensure that it is performing up to par. Nothing could be worse than never changing the filter resulting in filter failure from a contaminated filter left inside the bottle for an extended period. Replacement times of the filter depend on how often the unit is used but should at least happen once a year even if the portable water filter bottle has never been used to keep the integrity of the filter intact.